If you and your kids have discovered Rainbow Loom or a similar rubber band jewelry-making kit, you no doubt know how addictive this popular new toy/craft is for kids and adults alike. You can use one or more looms or use a mini loom or just a hook to make an endless array of bracelets, charms, and other creations in all sorts of colors and patterns. But this is one fad that's more than just fun; it can potentially boost some worthwhile skills in kids and impart some child development benefits. Aside from giving kids something pretty to wear and share with friends, making Rainbow Loom bracelets can teach kids important skills like focusing on a task and following directions. (Such skills are especially important for school-age kids, who are the most avid fans of these kits.) And planning color combinations and deciding how to use them in different patterns can also stimulate creativity. If you have a kindergartener, she may need quite a bit of practice before getting the hand of even some of the simple patterns like the single pattern bracelet. But if she wants to get it right, you will see your child practice and try over and over a skill that will be valuable as she learns a new sport, begins to learn how to read, picks up a musical instrument, or learns any new activity. This goes along with persistence, and it's an important skill for kids to have as they enter their school-age years. As children learn, they will rarely succeed the first time and will need to be patient to keep trying again. Not becoming frustrated and knowing how to work through setbacks--which can definitely happen as kids learn how to make different and more complicated patterns on the Rainbow Loom--is an important skill for school-age children to develop. Putting all those tiny rubber bands together, whether on the loom or on a hook, takes some good fine-motor coordination. (This is one reason why Rainbow Looms tend to be more popular with school-age kids, who are able to manipulate their fingers to handle precise work like this.) Making these bracelets and other Rainbow Loom crafts is a great way to fine tune those fine motor skills in kids and aid in kids' physical development. 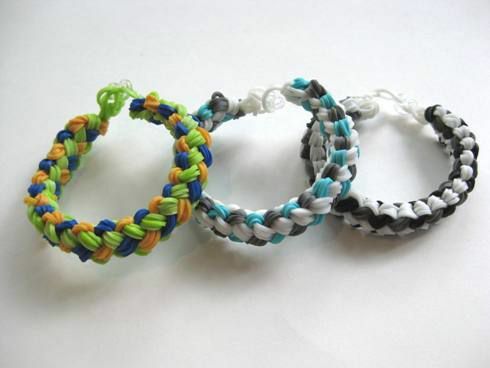 Making these rubber band bracelets--whether the patterns are simple or intricate--requires following a video or step-by-step instructions such as the ones I have on my site for a fishtail Rainbow Loom bracelet, three-pin fishtail bracelet, or a basic single pattern bracelet. For children who are in school and need to pay attention to teachers' directions all day long, this is a very important skill to develop. What will something look like when it's created using a pattern? How does an object or a shape appear when it's turned upside down, sideways, and rotated? When working with Rainbow Loom bracelets, kids will develop all these skills as they create the bracelets they want to make. And being able to visualize things is an important skill in math, which makes Rainbow Loom a deceptively fun math-related activity, just like online math games. When your child picks up a crayon or pencil and draws or uses materials in his crafts box to create something, he is exercising his imagination and learning how to think creatively. Similarly, a child who chooses the colors of rubber bands and decides how she wants to put them together to create certain pattern bracelets on the Rainbow Loom is learning how to design and use her imagination to create something tangible and real. Remember how proud your child was the first time she learned to write her name? Or when she learned some letters of the alphabet and colors and numbers? Children love learning and showing off what they can do, and these rubber band bracelet-making kits are the perfect way for kids to make things they can wear and share with pride. They absolutely love finishing a bracelet and putting it on or giving it to a friend as a way of saying, "I made this; I thought it up, I chose what it would look like, and I made it real." It is empowering, not to mention oh-so-satisfying! Many kids love to get together to make bracelets. (That's why having a Rainbow Loom party is an awesome theme for a kids' birthday party or other gatherings.) It's a way to be social, to share what they've made, and to help each other as they learn how to make different kinds of bracelets and other things on the Rainbow Loom. As they make pretty bracelets, kids can build social skills, learn how to cooperate, and learn how to help each other, just like they do in school.